Hi everyone!! 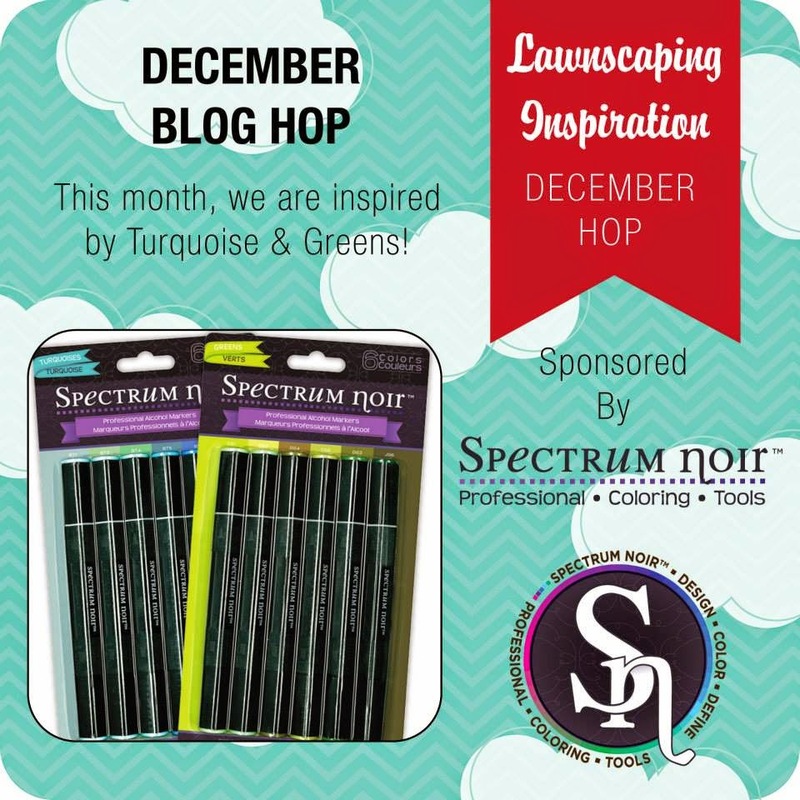 Welcome to the final Lawnscaping FIT Team Monthly Blog Hop for 2014! This month we are focusing and inspired by Greens and Turquoise colors!! Thank you to Spectrum Noir for sponsoring this hop once again!! You should have found your way to me by Isha, who is super talented!! Here is my card for this hop! I wanted to make something simple, but was colorful. I chose the stamp set "Wish You Were Here" and what a perfect way to represent these colors than this stamp set. I chose the globe image. I wanted to have fun and do something different than just coloring in the image. So I chose to use two colors of embossing powders - both from WOW! I die cut a piece of PTI Stampers Select white card stock ( my favorite) and used the circle stitched die from Simon Says Stamp. Then, I inked up my globe image with VersaFine Onyx Black ink. Usually when I emboss, I use my VersaMark Ink, but I really couldn't do that for what I wanted to do, so the next best thing is the VersaMarkER - I color in the areas I wanted blue, added the blue embossing powder, heat to set with my Milwaukee Heat Tool, and then moved on to the green areas and repeated the same process. I set my main panel aside, and worked on my card base which is the same white card stock. I wanted a subtle background and I absolutely love the Tiny Star background from Hero Arts. I inked it up in Wet Cement ink from Hero Arts. Then, I worked on my sentiment - I masked off "World" because I wanted it in green, and inked up the rest of the sentiment in my VersaFine Black ink, stamped it down, then masked off the other parts of the sentiment except "World" and stamped in in Green Hills ink, also from Hero Arts. I wanted it to stand out a bit more, so I took my Copic Multi Liner and outlined it, and it really made it pop! It was time to add my main focal point, so I added some foam adhesive and adhered it to my card base. So Fun, and colorful too!! Now, its time for me to send you off to Lenny - I am sure she has something awesome in store as well!! Remember to leave a comment for your chance to win some products from Spectrum Noir!! Take care and see you in the New Year!! A great CAS card, Kari! Awesome card!! Looove that star-y background, Kari!! perfect use of the colors! Super fun Kari! Love the idea of heat embossing the color! Great work! What a nice card!! I love these colours! Such a great idea! Love how your sentiment pops! Very cute, Love the background! I like your card very much. Great job!!! Your background is beautiful! And love your use of the colors!! Love muted background! it really helps to make your globe pop! so cute, love the background ! !wish you a Happy and creatively fulfilling New Year and looking forward to plenty of inspiration in 2015 too !! 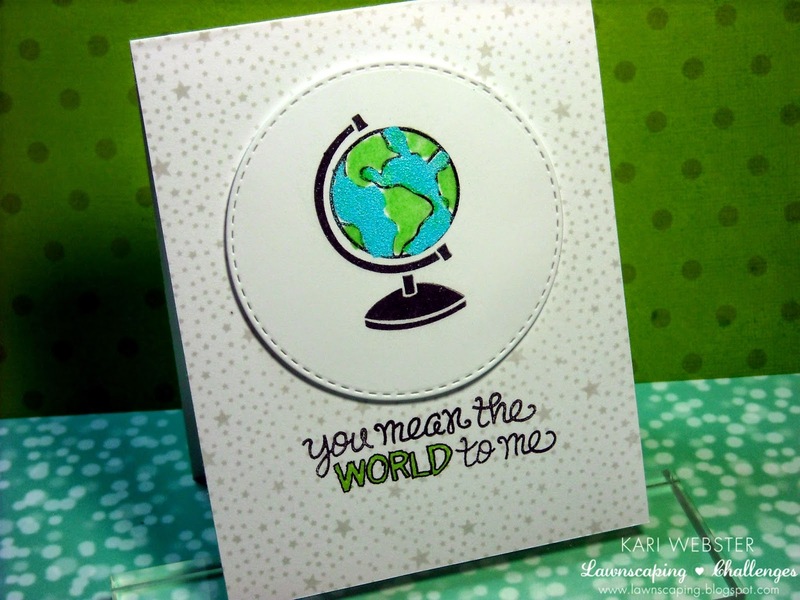 Beautiful card, the background is fabulous, great sentiment and the globe is WOW!!! Great job on the globe. Great idea with embossing, love your card. Great idea to make relief on the globe! And I really live the background. Beautiful card! Great choice for the colors. Great card! Really fab for guy cards. How adorable!! Love the colors you used!! Such a fun card, guaranteed to bring a smile to the face of whoever receives it! LF and SN = a combination sure to delight! I really like that stamped background. Cute card. Great card! I think something like this would be perfect for any special person in your life. Love your card design !!! Nice card! You inspire me! Beautiful card! I love embossing!! Lovely card! love the coloring of the earth! Great card, the globe really pops!! Everything is perfect about this card - love the background, the stitched round panel and stamps! Love your card, especially the circle design. So pretty! I just love the starry background. Such a beautiful card!!! Great card. Love the coloring and the circle design. What a fantastic card Kari! I love how you created the background! Great job, love the colors, the inking, the embossing,. TFS. So beautiful :) Love it, Kari! Awesome card and great job on the sentiment! What a great card...love the soft background with this globe image. I love the stitched circle and warm sentiment! very cute card..love the stitched circle!! i really like the big circle for a small image! So cute! love the design with the star background!